Is Vegas Underrating The Warriors? Our NBA playoff projections, which are based on a version of Jeremias Engelmann and Steve Ilardi’s Real Plus-Minus ratings (RPM), give the Golden State Warriors a 48 percent chance of winning the NBA title. Other statistical systems hold the Dubs in similarly high regard: The playoff probabilities at Basketball-Reference.com give them a 47 percent chance of winning a ring, and John Hollinger’s playoff odds put their chances at 38 percent. 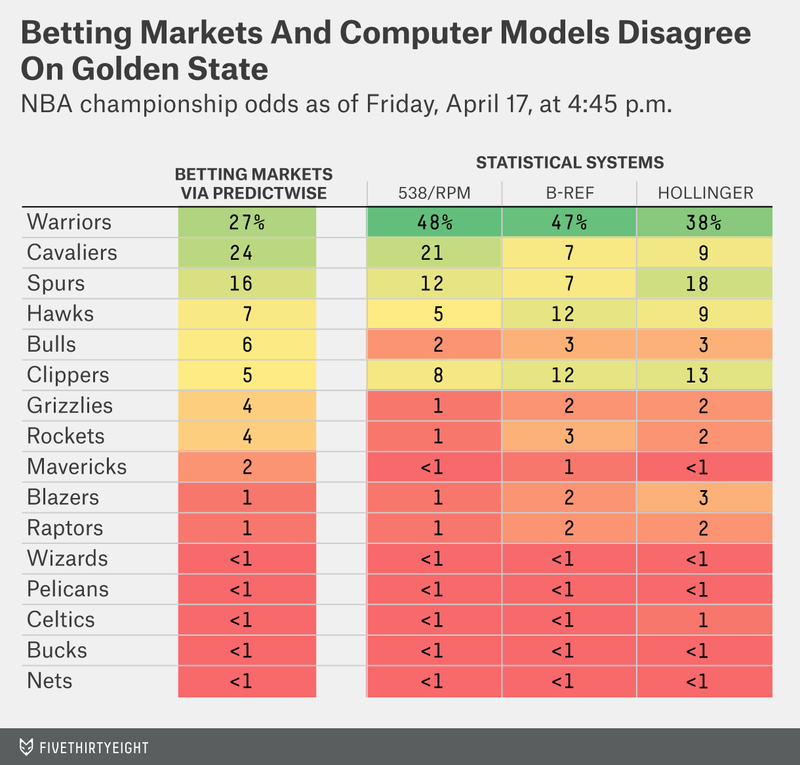 Gambling markets are more skeptical of Golden State. According to PredictWise, which compiles odds from Betfair and removes the “vig” (house cut), bettors have the Warriors with a 27 percent chance to win the title. And a number of sportsbooks consider LeBron James’s Cleveland Cavaliers to be the title favorites. So here’s a gut-check. The Warriors, with a 67-15 regular-season record, are the top overall seed and will have home-court advantage throughout the playoffs. How often does the top overall seed1 win the title? The answer — since the NBA expanded the playoffs to 16 teams in 1984 — is 45 percent of the time, almost exactly the chances RPM assigns to the Warriors. The top seed has won 14 titles in 31 attempts. And the Warriors, with 67 wins, are better than your average top seed. Since 1984, nine other top seeds have finished within two games of the Warriors’ regular-season win total (somewhere between 65 and 69 wins). Those teams went 7 for 9 in winning titles. In contrast to the single-elimination NCAA basketball tournament, the best-of-seven format in the NBA playoffs has historically allowed elite teams to rise to the top. We certainly do not recommend you naively trust statistical systems ahead of the handicappers. Vegas is really tough to beat. Gamblers can account for all the information in systems like RPM — plus whatever other data they think is relevant, like postseason experience or how teams match up with one another or the San Antonio Spurs beating the odds again and again. Still, we’re a little more likely to give credence to complex systems like RPM when they’re also able to pass simple gut-checks like this one. That is, the team with the best regular-season record, plus whatever tiebreakers apply.